There’s new competition to be the Upper Valley’s big cheese. Restaurant chain Domino’s Pizza recently established two locations in West Lebanon and Claremont, extending their delivery services to the surrounding area. The restaurants — open from 10 a.m. to 2 a.m. on weekdays and until 3 a.m. Fridays and Saturdays — pose a threat to the financial success of local businesses such as Hanover’s Everything But Anchovies, EBAs Marketing and Catering Manager Danielle Paro said. EBAs opened in Hanover in 1979. The restaurant serves pizzas, wings, pasta and sandwiches from 11 a.m. to exactly 2:10 a.m., making it an attractive choice for students in need of food late at night, Paro said. She said that Domino’s extended hours, as well as short delivery times, have contributed to the restaurant’s success among College students. “They opened a branch here and in Claremont at the same time, so they became a big presence in the Upper Valley,” Paro noted. Paro said that she met with a group of 20 Dartmouth students earlier in the term to discuss Domino’s opening and possible changes that could be made to encourage students to continue buying from EBAs. According to Paro, the students concluded that a large appeal of Domino’s was its faster delivery time. However, the reduced time is largely a function of Domino’s pre-made pizzas, she added. In order for EBAs to increase their speed of delivery, Paro said it would need to reduce its menu size. Domino’s has also undertaken a significant marketing effort on campus and in the area, offering discounts to Dartmouth students. Given its large marketing budget, the chain has been able to produce both television and radio advertisements. Although EBAs also has some radio advertisements, the company primarily relies on newspaper ads, Facebook posts and fliers to attract customers, Paro said. 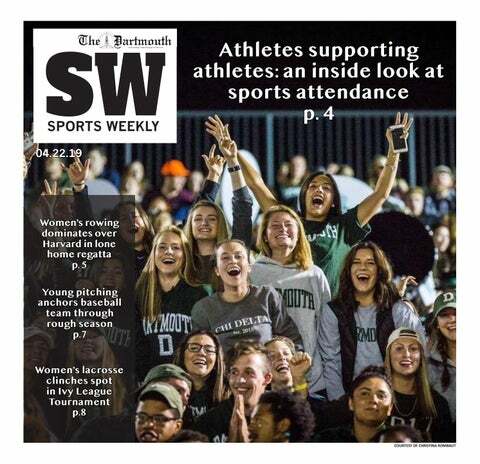 EBAs also sponsors events such as the Prouty and Children’s Hospital at Dartmouth-Hitchcock Hero races, Greek life philanthropic activities and Dartmouth athletics, Paro said, noting that this difference between EBAs small-scale marketing and Domino’s widespread advertising has definitely affected delivery sales to campus and the Upper Valley. “I generally order delivery, and this term I have ordered more from Domino’s just because they are open later and generally deliver faster than EBAs,” Rebecca Holland ’17 said. However, others such as Alexa Dlouhy’19, say that Domino’s later delivery hours do not influence their choice. Dlouhy said that she usually purchases more from EBAs in order to support local business. Another unforeseen competitor in Hanover is Dartmouth Dining Services’ food truck, which opened this fall. Featuring sliders, fries, brownies, churros and cheese fritters in addition to vegan options, the DDS food truck accepts payments of DBA and meal swipes in addition to credit cards. The DDS truck likely deters some students who do not want to or cannot take the $10 or $20 out of their pockets, Paro said. Speaking as the chair of Hanover’s Local Business Council, she added that EBAs and other local establishments would “absolutely” accept College dining dollars, but the school will not allow the restaurants to do so.